For those of you in the Northern Hemisphere, September 22nd marks the first day of Fall. 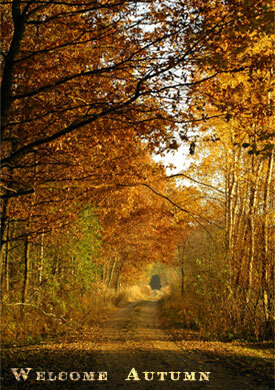 The official beginning of Autumn depends on where you are located in the world. For residents of North America, the times fall between 5:40AM – 1:14PM in 2008, but that changes yearly. Since this is the season that hosts our beloved Halloween, we really enjoy celebrating the Autumn Equinox. It’s also a good day to take a short break to observe the newly christened Autumn sun, relax, and just reflect. What’s so special about this day? Equinox comes from a Latin term meaning “equal night”. Today and on the first day of Spring, the tilt of the earth’s axis makes the nighttime equal to the daytime. Everywhere on earth experiences close to 12 hours of daylight and 12 hours of nighttime. That’s one awesome and unifying event. The Fall Equinox has been known by many other names over the centuries. Cultures from around the world call it: Alban Elfed, Autumn Equinox, Autumnal Equinox, Cornucopia, Higan or koreisai, Feast of Avilon, Festival of Dionysus, Harvest Home, Harvest Tide, Mabon, Night of the Hunter, Second Harvest Festival, Wine Harvest, Witch’s Thanksgiving, and of course the first day of autumn. Common themes found worldwide are balance, harvesting and abundance, remembrance of the dead and life’s fragility and the return of weather that favors slowing down, introspection, conservation, and reflection on the meaning of life. We also begin noticing the shortening of the days as we head towards the Winter Solstice. 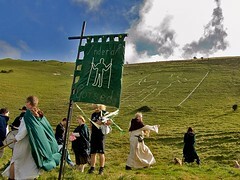 The celebration of the seasons is thought of mostly as an ancient practice, but more people are beginning to honor the equinox and solstice days. Equinox celebrations or Harvest Parties are popping up everywhere, regardless of religion, belief, or location in the world. The seasons change for everyone, so everyone can celebrate them! If you love a good mystery, the monoliths of the world also factor into the equinox and solstice days. Archaeoastronomy – studying a culture’s astronomy via material evidence such as their monolithic structures – has shown us that these structures offer incredibly accurate information about the changing of the seasons. 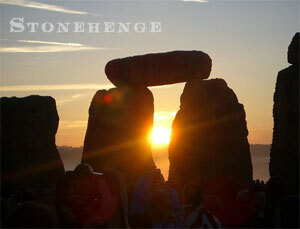 Using sacred geometry, sites like the Great Pyramid in Egypt and Stonehenge in England actually recreate the sky. At exact times during an equinox or solstice, amazing phenomenon with sound and light happen. What’s even more amazing is that these monoliths chart the movement of the stars just as accurately as our current methods (or more accurately, as some claim), yet they were created thousands of years before telescopes or other technology! How’s that for a bit of intrigue? You can learn more about the Autumn Equinox at Secular Seasons.com (includes activity and party ideas), Religious Tolerance.org, Megalithic Wiki, and Archaeoastronomy.com. Do you celebrate the first day of Autumn? Drop a comment and let us know how! Do you have a Halloween story or project to share? Contact us and we may feature it on our site! Subscribe to comments with RSS or TrackBack to 'Autumn Equinox: first day of Fall'. I love Fall !! In my house it is a tradtion to decorate on October 1 .